Well, the little rubber I got a few weeks back ate again, and is now in shed. Here's a picture of my setup, a 20 gallon long tank. This sits in a cool spot near the floor. Substrate is aspen bedding. On the left is an inverted plastic hide full of damp moss. The temp in most of the tank is in the high 60s F. There's a small undertank heat pad that is set as low as possible that brings the temp to 80 F under part of the corkbark hide. The weight on top of the screen top is a ceramic cast of an eastern hognose snake. ...I mentioned that the little boa ate a f/t pink while I held the snake in my hand. I tried the same thing a couple more times over the next couple weeks, but the boa wasn't interested. 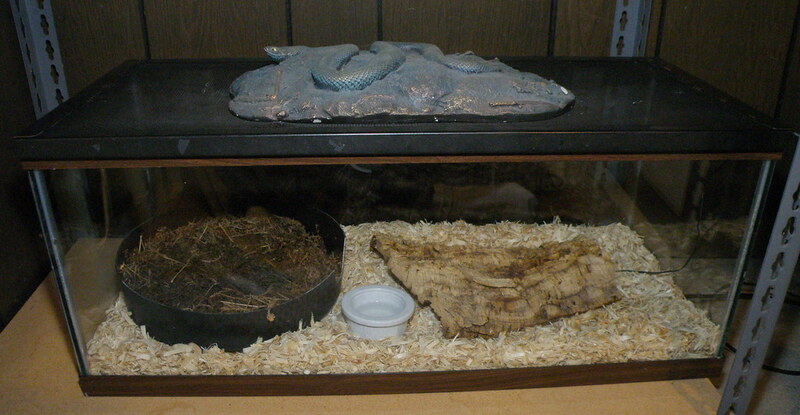 Then, a week ago, I put a f/t rat pink under the hide with the boa, and a few hours later the boa ate it. I'll put up more pics post-shed.